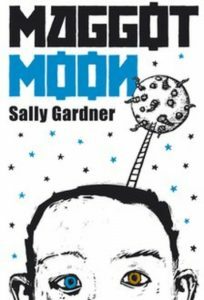 Review of Maggot Moon by Sally Gardner. Maggot Moon is a great read with a lovely visual storyline. It’s both imaginative and inspirational, and gives space for the reader to really absorb what’s going on and add in extra detail as and when you see fitting to do. Despite the oppressively dark and sinister backdrop, the central character ‘Standish’ beams a very bright light from every page. It is a tale of proud resistance set in a fascist state where, in the end, the power of what’s right rings true. Like both Sally Gardner and I, Standish is Dyslexic, although this is not explicitly labelled in the text, rather this is implied in the opening pages with the line, ‘Can’t read, can’t write, Standish Treadwell isn’t bright’. However, the text does not locate this as a deficit belonging to Standish, but quite smartly highlights the unique quality of his diversity and the problem as theirs; that is the traditional attitudes of others, the school system and society. This is reflected in the style and presentation of language that often creatively reworks typical linguist conventions, emphasising the visuality of the world as seen by the neurodiverse, that is as Standish states ‘eye-bending in its beauty’. Sally Gardner has done a good job of promoting Dyslexic pride with this work and while this is positive, I am left slightly confused by a quote on the website related to the book that asserts Dyslexia as being not a disability, but a gift. Even though I understand this perspective, I would challenge this in terms of the Social Model of Disability, in which people are disabled by barriers in society and not by the diversity of their bodies or minds, that is people’s impairments or conditions. While Dyslexia is not a deficit, society does disable Dyslexics through the way it rejects and ridicules our unique and beautiful thinking and communication style that challenges and does not conform to the traditions of an outdated and exclusionary education system. For Dyslexics to disassociate with the politics of disability, the collective struggle of disabled people and other marginalised identities to achieve an inclusive and equal world is weakened. Together we are stronger! As well as being a gripping story this book is really exceptional in terms of showing some publishing leadership, in terms of both accessible communication and inclusive design. I love books but the act of reading is hard work, I often find myself flicking ahead and thinking ‘OMG – shiny moving pages making no sense at all, how many pages left in this chapter, how many? AHHH I can’t cope’ and throw the book at the wall. Maggot Moon has one hundred chapters, but each one is no more than a couple of pages and is subtly illustrated with a mute flicker book style. This, and the low contrast cream colour pages made this very easy for me to maintain my attention. Additionally, the book is available in audio, and as a new funky style iBook that has loads of additional content that makes it not just a read but a super story experience. Previous Previous post: Dyslexic Discourse; E-book accessibility and the resistance of literacy norms on Maggot Moon.